Performance by Canberra Grammar School from the CD Selected works by AMC represented artists, vol. 33. 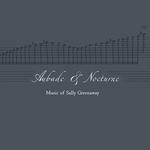 Aubade & nocturne / music of Sally Greenaway. Auróra Musis Amíca / Sally Greenaway. An uplifting and inspiring piece for young adult/student musicians. The pieces opens with a soundscape reminiscent of the dawn bursting into colour over a still lake. It then unfolds into an uplifting and hopeful fanfare before fading back into a wash of colours for the final bars. The piece includes some fun extended techniques, including bowed harp, bowed vibraphone and glockenspiel, flutter tonguing flutes, and some aleatoric moments for muted trumpets. Instrumentation: Wind Orchestra: 2 flutes, 1 oboe, 2 clarinets, bass clarinet in Bb, bassoon, 2 horns (3rd horn part optional), trumpet in C, 2 trumpets in Bb (3rd trumpet part optional), 2 trombones, bass trombone, tuba, triangle, bass drum, cymbals, tubular bells, glockenspiel, vibraphone, harp. Difficulty: Medium — flutes need to be able to flutter tongue, pitched percussionist need bows, trumpets need harmon mutes. Commission note: Commissioned by Combined Canberra Grammar Schools Music Departments for the Centenary of Canberra and the Canberra International Music Festival 2013. Influenced by Holst's Planet Suite. Combines jazz harmony and scales with extended classical techniques (aleatoric or improvised sections, bowed percussion flutter tonguing flutes). 21 Oct 13: Larry Sitsky Recital Room, ANU School of Music, Canberra. Featuring Sally Greenaway. 19 May 2013: at Marion's Child (Canberra Girls' Grammar School). Featuring Canberra Grammar School.